When you want to encourage your teenage children to hang out at home, it’s necessary to create an environment into which their friends willingly flutter. You can learn a lot about how to attract butterflies to your garden by paying attention to how in the world so many kids end up in your basement and backyard. Think about it: You probably created your teen garden by offering tasty snacks, healthy beverages, cushy couches and outdoor space that is pleasant but not so tidy that they can’t feel comfortable running around or playing “capture the flag.” They’ve found a safe place to roost in sun and shade. That’s what butterflies need as well. Give butterflies and their caterpillar babies suitable food and lodging, and they may keep coming back. In fact, they may move into your yard and spend the winter hybernating or otherwise hunkered down if they are not the type to migrate. However, the variety of plants in your yard is the main reason why butterflies do or don’t visit. Salvias are popular restaurants for adult butterflies that love nectar. But other types of plants and attractions are also necessary to create a butterfly haven. Color, shape, texture, smell and easy accessibility to nectar attract most adult butterflies to flowers. But for some, the dinner bell rings when their sensitive antennae and feet smell tempting sap on a tree or decaying organic matter on the ground, including animal droppings and pieces of juicy, rotting fruit. We realize that most people mean something else when they say that feet smell, but butterfly feet really are part of their sniffers. A variety of factors determine whether, and what kind of, butterflies frequent or take up residence in your yard. One major way to invite butterflies into your life is by planting a wide variety of colorful, nectar flowers that have open faces or short throats. Many kinds of Salvias, including Autumn Sage (S. greggii), Prairie Sage (S. azurea), Cleveland Sage (S. clevelandii), Mexican Bush Sage (S. leucantha), Mountain Sage (S. microphylla) and Pineapple Sage (S. elegans), which have blossoms that either are just right for the tongue-like proboscis of a butterfly or moth to access. Overall, Salvias are particularly tempting to the following groups of butterflies: Swallowtails, Sulphers, Skippers and Brushfoots (a category that includes Monarchs, Mourning Cloaks and Gulf Fritillaries). Other easy-to-reach sources of nectar include many daisy-like flowers -- which are in the same plant family -- such as, Coneflower (Rudbeckia), Marigold (Tagetes) and Zinnia. Butterflies also love flowering herbs, Lavender (Lavendula), Milkweed (Asclepias) and more flowering species than we can possibly list here. In contrast, the deep, trumpet-shaped blossoms of Red Velvet Sage (S. confertiflora) and Hollyhock (Alcea) were made by nature for the long beaks of hummingbirds. However, making nectar accessible is not your only concern when selecting flowers to attract butterflies. Although adult butterflies have favorite nectar plants, those may not be the same ones they need for laying eggs. 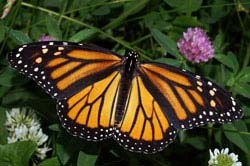 Some butterflies, such as Monarchs, will only lay eggs on one kind of host plant. In the case of Monarchs, it is Milkweeds (Asclepias spp. ), because Monarch caterpillars only eat that plant's foliage. Monarch adults enjoy Milkweed nectar. Although Monarchs and many butterfly species are attracted to the nectar of Salvias, they don’t choose them as host plants. Planting a butterfly garden is an ecofriendly act and a wise move for gardeners who want good pollination in their gardens. To accommodate the need for host plants, Flowers by the Sea grows a number of beautiful Milkweeds. 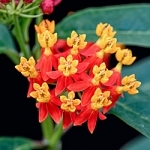 These include Wild Cotton (Asclepias cancellata), Orange Blood Flower (Asclepias curassavica 'Orange Form'), Golden Bloodflower (A. curassavica ‘Silky Gold’), Indian Milkweed (A. eriocarpa), Swamp Milkweed (Asclepias incarnata 'Cinderella'), Swan Plant (A. physocarpa), Showy Milkweed (A. speciosa) and Butterfly Weed (Asclepias tuberosa). Orchestrating a flowerbed that is alluring to a variety of beneficial winged creatures while also providing shelter for eggs and caterpillars can be complicated. However, with careful planning, it is possible to attract adult butterflies, accommodate their offspring and also be inviting to hummingbirds and bees. Online, a good place to begin researching butterfly gardening is the North American Butterfly Association (NABA). Its abundant information includes a list of North American butterflies occurring north of Mexico as well as a list of butterfly plants by region. A phone call or visit to the nearest office of your state agricultural cooperative extension can also help in deciding what plants to grow to attract local butterflies. This will save you time and money. Beyond nectar and host plants, butterflies also need good places to bask in the sun, such as large rocks, and shady puddles of muddy water. Nectar doesn’t meet all of a butterfly’s nutritional needs. Muddy water not only hydrates butterflies but also gives them the minerals necessary to stay healthy. A good way to maintain a local watering place for Lepidoptera is to dig a hole in the garden that is big enough for a cleaning bucket. Fill the bucket with wet soil or sand and add water until it is soaked. Place small rocks and brush around the lip of the bucket to give butterflies places to perch when not playing in the puddle. Butterflies don’t favor a tidy garden in which all plant debris is picked up. A pile of brush or firewood placed near the garden gives them protective crevices in which to hide from predators, get out of rainy weather and, possibly, winter over. Just keep in mind that butterflies are houseguests that don’t mind a messy room. If you strategically tuck rotting apples or a watermelon rind on the ground or on a rock, many butterflies will enjoy the change of menu. To paraphrase a well-known adage, a gardener’s garbage is a butterfly’s treasure. To find botanical treasures for butterflies, please visit our butterfly plant menu or contact us at FBTS. We'll help you get your wildlife garden flying. I'm in love with your plants and look forward to their arrival every year! They are always beautiful and healthy! Few people offer the selection that you have and I'm thankful for your website! Beautifully grown plants of unusual hard to get varieties. I've potted them on to keep them growing through the heat of the Austin summer; looking forward to placing them in the garden this fall.